I always love a good period piece. More often than not, they can be detail-oriented and historically accurate. Janie Bryant gives the actors on Mad Men 1960s-era undergarments, even when we won’t actually see them, to make sure the clothes have the right fit. But I always find it interesting when the costumes and hair reflect the time in which the piece was made. Sometimes it’s intentional – I read that while working on the recent adaptation of Anna Karenina starring Keira Knightley, Jacqueline Durran took some of her inspiration for the nineteenth century drama from the silhouettes of the 1950s. And while the stunning costumes for The Tudors were mostly accurate, designer Joan Bergin did incorporate some slightly modern touches to make them more accessible to the audience and put a unique stamp on the look of the series. Sometimes I wonder if some past classics were as intentionally modern, or if they simply didn’t put as much stress on history. 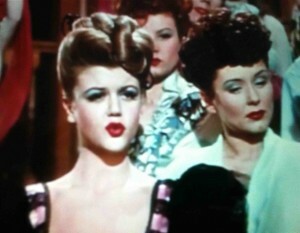 I seem to notice that trend a lot in 1940s & 1950s films, especially when it comes to hair and shoes. An actress will have a beautiful Elizabethan gown, but a distinctively ’40s roll to her hair. Or satin pumps with a 19th century saloon dress, like in 1946’s The Harvey Girls. While 1952’s Singin’ in the Rain is a masterpiece of 1920s fashion, Tea for Two (from two years earlier) often looks much more like a modern 1950s movie. Most of the film takes place in the 1920s, but is bookended by present-day scenes featuring the main characters’ children. It always cracks me up to see them dress up in their parents’ old clothes from the ’20s and make a point of teasing them about how out of date they look. 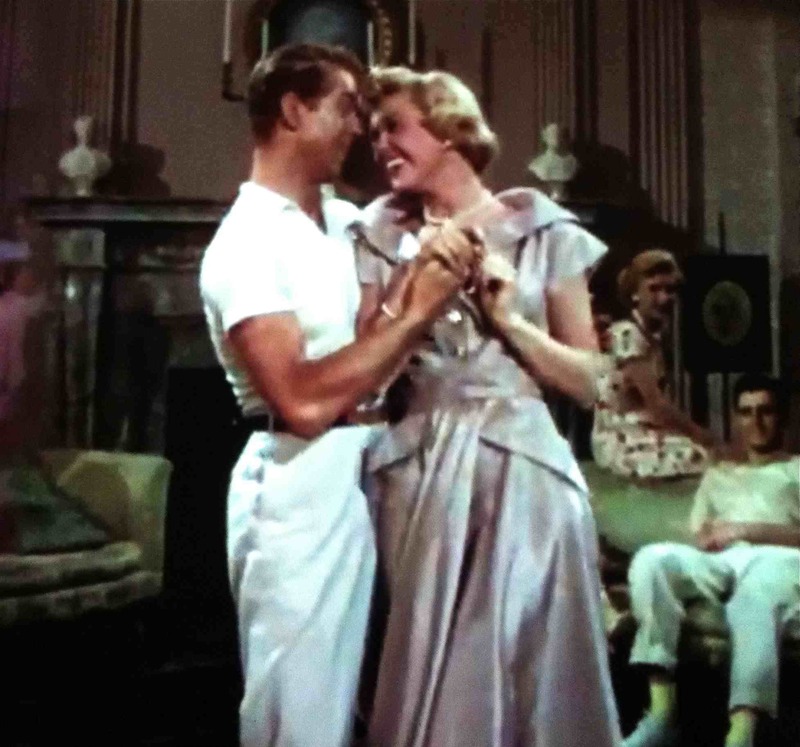 Throughout the bulk of the flashback story, Doris Day’s outfits are much more modern (though still pretty!). There are times you might not even know you’re looking at a period piece. One of my favorite more recent examples is the 1987 classic Dirty Dancing. While so much of the film reflects the fashions of the year in which it was set (1963), there are definitely some ’80s touches. Lisa definitely looks the part of a Jackie Kennedy wannabe, and Johnny’s DA hairstyle is great. But Penny’s rehearsal leotards are more the high-cut style not popular till the ’70s and ’80s. And Baby’s curly hairstyle and tank tops have a more modern feel. I wonder if audiences twenty or thirty years from now will look back at our current period pieces and say the same thing – that they so reflect the early 21st century. It doesn’t seem as prevalent now as it did in other decades, but you never know! *The women’s costume designer for The Harvey Girls was Helen Rose; Singin’ in the Rain featured Walter Plunkett’s designs; Tea for Two‘s costume designer was Leah Rhodes; and Dirty Dancing was designed by Hilary Rosenfeld.